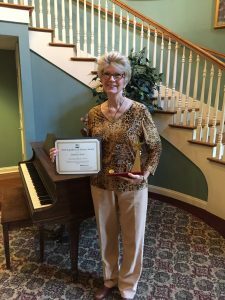 St. Francis Villa Assisted Living has another award winning staff member!!! For the third time in the past several years, one of St. Francis’ staff has been honored by the Louisiana Assisted Living Association as an outstanding member of the industry. We are proud to announce that this year’s statewide Outstanding Department Director award went to our own Barbara Deris!!! To countless seniors, caregivers and families in the New Orleans area, Barbara is much more than an outstanding department director. She’s a light of hope, relief from major stress, a wise guide and a real partner in care who walks through difficult journeys time and again, making the way a little easier for those who haven’t been before. Barbara Deris has given her life to the care of seniors in Louisiana. At St. Francis Villa alone, Barbara has cared for over 500 Louisiana seniors. Add to that number the families, friends, and staff who’ve looked to her for guidance and counted on her care, and it becomes clear that Barbara has been an enormous force for good, a true example of excellence, and has changed the face of Louisiana assisted living for the better. It’s people like Barbara that have made assisted living what it is and have set the standard for a new generation of nurses and caregivers, creating an industry that we can be proud to work in and that truly makes a positive difference in the lives of the elderly and their families. Spend a few moments watching Barbara work, and you’ll know you are in the presence of greatness. Residents light up when they see her coming and they view her word as “law.” They trust Barbara and find comfort in her during sickness and uncertainty. She has a building full of residents to care for and yet each resident feels as if Barbara is “her own” nurse. Barbara gives the kind of experienced, knowledgeable care that only comes with years of devotion to a craft. Her kind touch, willing hugs and depth of love add to that expertise, making her a true superstar to those she cares for and those she supervises. Barbara’s work has not been without sacrifice. On-call 24/7 for upwards of 30 years, Barbara has many times left her bed, left her own plans, returned early from vacations, and gone out of her way to be there for a resident’s passing, to help a family make a difficult decision, to dry a resident’s tears and to come through for those who count on her. She lives a lifestyle of putting others before herself in true servant leadership. This translates into a home where residents find happiness and love and where their families find peace of mind and real solutions. St. Francis Villa congratulates Barbara Deris for many years of a job well done, and is so pleased to see her receive statewide recognition.